Three-years crisis forces companies to work even harder, not only they have to be more creative in leveraging sales, aggressive cost cutting is inevitable and mandatory. The tremendous cost pressure exerted by the crisis a major risk of saving at the wrong end. Across-the-board budget cuts are generally regarded as an effective way of implementing unpopular measures. But the danger is that “across-the-board cuts” can also do away with activities that could help to tackle the crisis. It is indeed challenging to strike the right balance necessary for short-term cost reductions and their long-term consequences. The challenge is to lower costs quickly without causing any long-term damage to the company. This calls for more focus, yet intelligent approaches than simple-minded mass layoffs. Companies must utilize as many levers as possible to reduce costs while simultaneously being cautious not to cut back in the wrong places. This post overviews those levers in an aim to provide a more focus, yet intelligent cost cutting program. This is by no mean implemented-ready. Rather, it is a better kick-off for Accountants. I also realized that Business Managers are often more creative in problem-solving matters. For that reason, I recommend you to have some brainstorms with them for more creative cost cutting program. Are We Having a Cost or Sales Crisis? The crisis we have had since 2007 and worsened in 2008-2009, is a sales and revenue crisis, not a cost crisis. Sales volumes and revenues have dropped—customers are simply refusing to buy. Competition from low-wage countries or an unfavorable dollar exchange rate the main problem (it was the case in former crises). The reason that both private and business customers are refusing to buy is that the fear of the future has them hoarding their money. “Cash is king” is true for companies and consumers alike. One motive for hoarding cash is to make up for losses in their investment portfolios. The more serious the crisis, the more pronounced these tendencies are becoming. In term with productivity, for example, a car maker may need to sale 5% more cars every year. If they make the same sales as last year, to produce the same number of cars, the company would therefore need 5% fewer employees every year. In other words, if the sales figures stayed the same, layoffs or reductions of work time would be inevitable. The situation only worsens if sales figures crash by 10, 20 or 40% – as has been the case in this crisis. Such a dramatic drop in sales makes quick and decisive cost cuts unavoidable. Partial pay cuts generated real cost savings. Work time accounts where workers accumulated overtime in prosperous times were offset against unpaid free time. Many companies went a step further and slashed working hours. These are considered as relatively soft and temporary solutions to keep the company sustained for a limited period of time. If the crisis continues for a long period, mass layoffs become the only alternative. This is exactly what has happened in the current crisis: in many industries, layoffs and closures have been unavoidable. The presumed duration of the crisis is a highly critical aspect of all cost considerations. Instant and radical actions like closures and layoffs often seem like a good idea at the moment, but in the long term they may prove to be grave mistakes. Uncertainty runs high, and companies do not know how to react. In this situation it is advisable to make cost adjustments as flexible as possible and to avoid decisions that are difficult to reverse. Instead, companies should use as many cost drivers as possible to achieve the necessary savings. The price was at $100, the variable unit costs were at $60, and the fixed costs at $30 million. One million product units were sold, putting the revenue at $100 million and the profit at $10 million. What is the breakeven volume, that is, the volume of zero profit, in this case? It is easily determined by dividing the fixed costs by the unit contribution margin (price minus variable unit costs, that is, 100 – 60 = $40). Next, $30 million divided by $40 equals 750,000 units. What if “Sales Volume” drops by 40%? It means, the sales is 600,000 [= 1 millions – (40% x 1 millions)]. This figure is clearly below the breakeven volume. Everything else is unchanged. Therefore, revenue sinks to $60 million. Costs fall only to $66 million [=$30 million fixed costs plus 600,000 × 60 = $36 million variable costs], thus causing a loss of $6 million. The margin or return on sales is still 10%, but with the wrong (negative) sign. If things continue this way, the company’s survival is endangered. It is obvious that costs and the breakeven volume have to be reduced considerably and quickly. (a). If the company in this case could effectively lower the variable unit costs by 20% to $48, the unit contribution margin would reach $52 and the breakeven volume would drop to 576,923 units. As a result, a sales volume of 600,000 units would be above the breakeven volume–even achieving a modest profit of $1.2 million or 2% of sales. (b). Decreasing the variable costs by 15%, on the other hand, would not put the company in the profit zone. There would still be a loss of $600,000. (c). Lowering the fixed costs by 20%, normally impossible in the short term, leads to a breakeven volume of 600,000 units and, thus, zero profit. The above simple calculations reveal that extreme cost cuts are necessary to compensate for such collapses. A short-term drop of 10, 15, let alone 20%, in variable unit costs is difficult to achieve. This is even truer for fixed costs, which by definition do not vary by volume and cannot be reduced quickly. Cost cuts alone are simply not sufficient to counter the dramatic sales and revenue drops in the current crisis. Companies must mobilize all available forces on the sales and price fronts to alleviate the sales collapse. Steep variable costs are an advantage in a crisis, while flat variable costs are better in growth periods. In the above example, a $60 variable unit cost is fairly high and the cost curve is thus steep. In the context of a dramatic sales drop, this means that total costs plunge dramatically. With a sales decline of 40% or 400,000 units, variable costs automatically slide by $24 million. If we flip the figures around, that is, assume fixed costs of $60 million and variable unit costs of $30, the initial situation would not change. Revenue would remain at $100 million, total costs at $90 million, and profit at $10 million. The breakeven volume would, however, strongly increase to 857,143 units from 750,000 units (=$60 million divided by $70). A sales collapse of 40% would cause variable costs to decline by only $12 million and cause a loss of $18 million. The negative margin or return on sales (ROS) shoots up to 30% – enough to quickly take a company down. In brief, in times of growth, it will be in opposite effect. If sales volume climbs to 1.2 million units from 1 million, $18 million in profit would result in the original cost parameters ($60 variable unit costs and $30 million fixed costs). This profit would be 80% higher than what we started with. In a situation with $60 million fixed costs and $30 variable unit costs, profit jumps 140% to $24 million. When a company grows, flat variable costs are favorable; in a crisis, it’s better to have steep variable costs. A similar situation is well known: A firm choosing between an employed Sales Representative; OR a Freelance Agent. If revenue is low, agents are more affordable as they earn only commissions (variable costs), but do not incur any fixed costs. In contrast, it is cheaper to employ the sales rep in times of high or increasing revenue, as they receive a fixed pay (fixed costs), but take in only small commissions (variable costs). In other words, companies with high shares of variable costs have an advantage in the current crisis. In any case, it is important to remain realistic about cost-cutting potential in view of the extreme slumps in sales and revenue. Cost-cutting potentials are often quite limited today. In recent years, purchase prices have been pushed down to an extent that the scope for further cuts is now constrained. Manufacturing and supply chain processes have been optimized so that the room for further improvement is quite narrow, indeed. Let’s therefore now turn to focus on what does work (labor cost reduction) but in various intelligent options for labor cost reductions. Note: Vacation days, special leave, different wage brackets, and so on can be added to this list. But let’s work at a simple example here. Assumed that the weekly wage budget drops by the same percentage to $8 million. What can the company do? It shows the scenarios in which only one cost driver is reduced as well as various combinations of cost drivers (A, B and C). All these variants cut the labor costs to less than $8 million. Combining cost drivers appears less drastic than simply making “one-dimensional” mass layoffs. Further cost drivers can be included, such as wage adjustments for individual employees or employee groups, unpaid vacation, special leave with part pay, part-time work models, and so on. Another method is to slow down the speed of assembly lines, as some automotive manufacturers are doing. So far, this cost-cutting measure has assumed a 20% drop in revenue and ensuingly in the wage budget. The situation looks much better if we assume that the company is fighting against the sales slump and can limit the revenue decline to 10%. Then the wage budget only has to be cut by 10% instead of 20%. 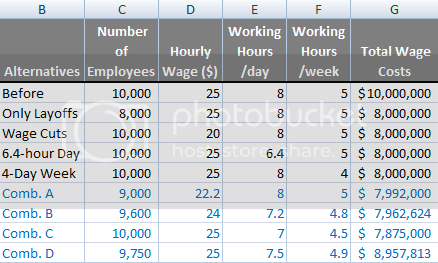 Combination D (the bottom row in the above table) shows that the necessary cuts in this case are considerably less drastic than in the 20% cost reduction scenario. Now each cost driver only has to be lowered by a small amount and the hourly wage is not even touched. These kinds of “softer” solutions make a lot of sense. Even so, employees will have to face the bitter truth that pay cuts are inevitable. Is it possible to adopt these flexible solutions in practice? These ideas cannot be turned into reality unless everyone involved climbs down from dogmatic positions and pulls together as a team! Managers, in many markets face the constant challenge of balancing rigid resources against fluctuating market demands, whether there is a crisis or not. The rigidity of resources is partly due to government regulations such as dismissal protection and other rules that constrain a company’s maneuverability (concerning relocations, reassignments, wage adjustments and so on). But many of the restricting factors (such as wage and bargaining agreements, company policy and corporate culture) reside in the companies themselves. This behavior is not entirely new. Labor conditions have long become more flexible, especially at midsized companies. Employers and trade unions, therefore, should recognize the gravity of the situation and are willing to make significant concessions and act more flexibly. The U.S. has one of the most flexible labor markets, and as a result American companies can shed employees relatively easily in a downturn and then rehire when times improve. Such flexibility provides less incentive for U.S. firms to avoid layoffs. This is further compounded by the fact that U.S. firms pick up a large portion of the health insurance bill of their workers due to the lack of social safety nets, and thus can cut costs beyond wages by dismissing employees. Such flexibility does not mean U.S. companies should not strive to find more creative solutions. In downturns, hours worked decline on average and some firms seek alternatives to dismissals, especially for highly skilled employees. However, according to a recent survey of 245 U.S. companies, layoffs are still more common, with 65% stating they had cut jobs or plan to cut jobs compared to 36% that are ordering or offering furloughs. Outsourcing, or transferring work to a third-party provider, has become a major trend in recent years. In most cases cost cutting was the motivation to outsource. The third-party provider, often based in a low-wage country, simply offered to make the product or provide the service at a lower cost. As an unwarranted side effect many companies experienced quality problems from outsourcing. Insourcing can be a useful way of bringing work back to the company and improving capacity utilization. If the costs of underutilized capacity are mainly fixed, insourcing can result in lower unit costs. This is because the outsourcing costs no longer apply, and internally only the marginal costs have to be added. One variation of this method is “internal insourcing,” that is, relocating production from abroad back to the home market. How quickly these effects emerge depends on contractual obligations. Given sufficient flexibility, a company can outsource more actively during a boom, and revert back to insourcing during a slump. This system works in a way similar to flexible worktime accounts. Given the imminent cost pressures, employee layoffs may seem unavoidable, even within the core workforce. Yes, these layoffs may effectively reduce costs, but they also endanger valuable know-how. Letting experienced people go in a crisis is a big risk. What happens if these qualified workers are needed again in 6 or 9 months but don’t come back? They may have become disillusioned with the company and looked for a job elsewhere. Employee turnover and the associated loss of expertise is a factor whose strategic importance can hardly be overestimated, especially for companies with a highly skilled workforce. Crisis or not, employers should therefore avoid letting go of highly qualified employees, or at least keep the cutbacks to a minimum. Eliminating talent and then quickly rehiring talent is an expensive and risky proposition. Savings that may weaken a company’s market position should also be approached with great caution. Time and again, we witness that firms counter cost pressure by scrimping on product quality. Such cuts can be extremely harmful, in both the medium and the long term. This is illustrated by automakers’ experiences with the radical cutbacks by the infamous Ignacio Lopez who worked for General Motors and later Volkswagen. Even in the crisis, customers are reluctant to accept inferior quality. On the contrary, the crisis leads to a greater emphasis on safety, and good quality plays a vital role. The key is to distinguish between components that impact the customers’ quality perception and those that don’t. However, this tenet has long since been practiced in the automotive industry and other sectors. Companies are strongly advised not to give in to cost pressures by delivering poorer-quality products. Another crucial distinction must be made between value-creating activities with an immediate impact and measures that have no, or only a very long-term, effect on results. This applies equally to cost-cutting and sales-promoting activities. 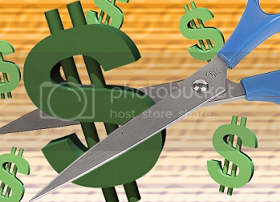 In marketing, for example, cutting back on sponsoring or long-term image-boosting measures is more acceptable in the crisis than reducing the budget for activities that have an immediate impact on sales. A hazard emerges when cost-oriented managers or investors get their hands on companies whose success hinges on soft factors such as brand image, customer enthusiasm or reputation. These soft values do not just exist but call for ongoing investments. The returns on these investments usually cannot be quantified in hard numbers. Notorious cost cutters often dismiss the importance of such soft factors. The trade-off between marketing needs and cost requirements must always be considered carefully. During a crisis, the danger of making cuts in the wrong places is very great. Cost cutting is the most common tool for tackling the crisis, not least because it is ostensibly under companies’ control – unlike market measures, in which the customers also have a say. However, even on the cost side control is not complete. Cutbacks always affect people, be it employees or suppliers. That’s why it is important not to go too far, otherwise the reactions on the other side could be disastrous.